New militant group, New Delta Avengers have declared war on Federal Government of Nigeria and oil companies in the south-east region. The militant group vowed to resume bloody attacks on oil facilities in Delta State effective from June 30, 2017. 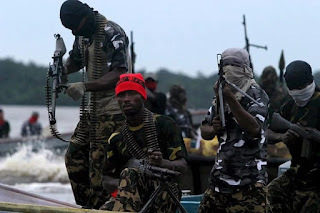 The group, which claimed to be made up of ex-militants, through its Spokesperson, CPL Oleum Bellum, cautioned that those who try their resolve will be made scapegoats. The statement reads, “From the oil producing part of Delta State, we have converged and agreed to resume attacks on oil facilities, resurrect the spirit of insurgency and made a demand for a better deal for our people, and by extension, our beloved Delta state. We will do this through bloody attacks, crippling oil industry in Delta State. “We watch the activities, policies of Governor Ifeanyi Okowa’s administration in these past two years, and we have found that, like the biblical Pharaoh, only extraordinary action will soften his hardened heart towards the oil producing areas of the state. While developments are going on in Rivers and other states, oil communities in Delta have been stagnant. “As a result, we have decided to take up arms and return to the essence of our agitation for the development of oil producing communities.